Located on Demoss Road in Benton City on the ridge of Red Mountain along the Yakima River is ' The Cellar'. A quaint personalized one bedroom luxury suite with full kitchen, laundry facilities, wood fireplace, marble bathroom, living room, tastefully decorated and well appointed. Private entry to a beautiful walk out basement on the lower level of this home with stunning views of horse heaven hills to the south, Yakima river frontage and Rattlesnake Mountain to the north. Vineyards are within hiking distance to all wineries on Red Mountain for the active person or a short drive if you prefer. Enjoy cranes, eagles, hawks and many species of birds along the Yakima river. Jack rabbits are common when hiking. Awaken to the sounds of birds and fall asleep with a stunning night sky. In the winter, stay cozy with a wood fireplace. Enjoy your stay while tasting wine on Red Mountain. We are centrally located so Prosser is 25 miles west, Yakima 70 miles west and Walla Walla is 70 miles east of The Cellar. We purchased our land in 2006 and built our custom home in 2010 with much planning. We enjoy making a comfortable quaint space for you to stay, a home away from home. A unique rental with a lot of love and attention put into our home. My husband did much of the finish work himself. The walkout basement was built with the wine tourists of Red Mountain in mind, so much thought and attention has been placed into this rental. Beautiful views in the heart of Red Mountain. Views of Yakima River, Horse Heaven Hills, Rattlesnake Mountain and within walking distance to Red Mountain wineries. 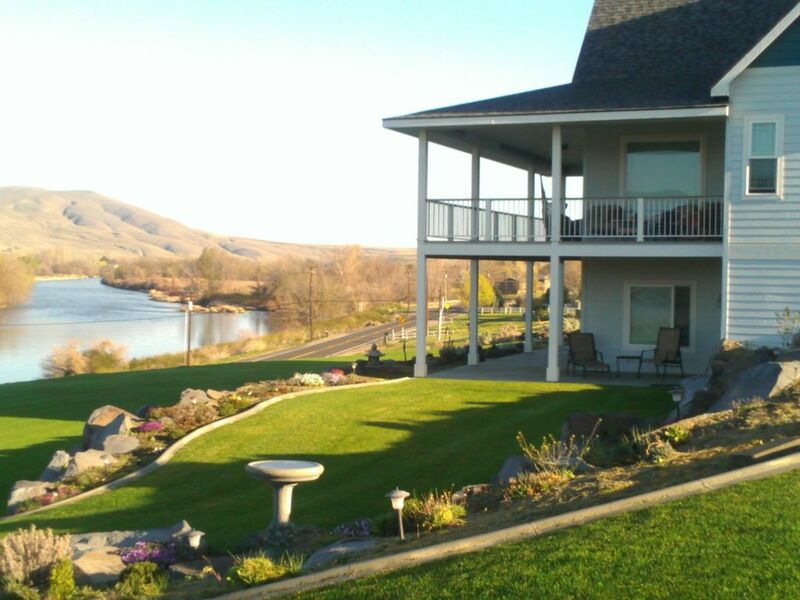 Located Above the Yakima River with views of the river and the wildlife. Located on the Yakima River. Well-equipped and comfortable accommodation very close to the Red Mountain wineries with great views along the river. We enjoyed wine-tasting in the area before returning to relax in the luxurious surroundings of the cellar. There were thoughtful touches provided such as the wine video and wine maps which we appreciated. Overall a great stay. We love staying here! It's a great place to relax and enjoy ourselves. Beautiful, peaceful home and setting. Will definitely stay again! The home was beautiful and owner was very friendly and helpful. We are planning on staying again. Just as advertised. A wonderful respite with peace and quiet and the river and broad horizons. The hosts continue to offer a high quality haven away from the stresses of city life. Their efforts to provide a consistently top notch VRBO experience continue to meet expectations. We had a fantastic time at this property in Sep 2017. The purpose of our trip was to visit some of the vineyards on Red Mountain. The property was clean and comfortable. It has a full kitchen, living room, master bedroom, bathroom, and laundry area. The house is located right off the road with views of the river. We were able to go on a 6 mile jog one morning down the quiet road. Owners were very friendly and parking wasn't an issue. Visitors will probably need a car to visit most of the vineyards on Red Mountain, but this location is about as close as you can get. Overall, this was a great experience. Only minor issue is that the WiFi was slow. Another great tranquil stay in the heart of Red Mountain wine country. Top notch and plush, this accommodation is very high quality. With amazing views of the Yakima River and views to the West and South, this high-ceiling apartment is anything but a cellar. Modern, very clean and spacious. The hosts are quiet, personable and easy going. This was our second visit in 6 months. Easy Access to all Red Mountain Wineries.